National Safety Day is observed on 4th March every year. The day is observed as safety day because on this day Government of India constituted the National Safety Council of India. 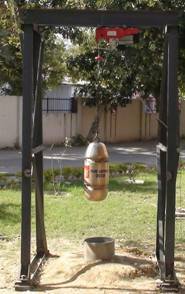 The safety day was celebrated by Indian Institute of Technology Kanpur on 4th March. On this occasion various safety awareness competitions such as Safety Poster and Safety Slogans were organized for students and staff of the IITK. The competition received the overwhelming response from all the categories. On the eve of National Safety Day the safety oath was administered by the Prof S C Srivastava Deputy Director and Safety cell declaration and prizes to the winners of the competition was given away by Prof. Indranil Manna Director IITK. Other dignities present were Prof. Amalendu Chandra DoRD, Prof. A K Ghosh DoSA and Prof. Sudhir Misra Civil Engg. and other faculties and officers of the institute. Mr. Narayana Murthy as chief guest inaugurated the Golden Jubilee celebrations. A documentary on IITK premiered during the function. 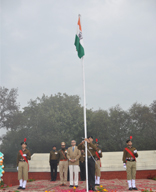 Detials of the events and projects for this period are at the website http://www.cse.iitk.ac.in/users/gj/new/. Dr. T. Ramasami, Secretary, Department of Science & Technology, Government of India, inaugurated DST Unit on Nanosciences & Launching of Indo-US Science & Technologry Forum Initiative on Fabrionics on December 7, 2008 at Nanosciences Laboratory Building, IIT Kanpur. Dr. Samir K. Brahmachari, Director General, Council of Scientific & Industrial Research, Government of India was the Guest of Honor. The programme was welcome by Dr. K. Muralidhar, Dean R & D, IIT Kanpur and addressed by Prof. S. G. Dhande, Director, IIT Kanpur. Vote of thanks by Prof. Ashutosh Sharma, Coordinator, DST Unit on Nanosciences. 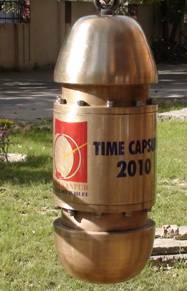 What is a time capsule? Organizations see tumultuous progress and tidings over decades and centuries. The participants in, what is nothing short of drama, indulge in intense debates and discussions, in classrooms and research laboratories, and possibly at street corners! The growth of the organization is sporadic but definitive. Can these milestones be singled out and recorded for posterity? The time capsule captures these trends quite subtly as nonlinear growth of an Institute, the recurring themes and values, and newer concerns that prepare a society for the future. Decades (indeed, generations) later, future societies would reflect on what we stood for as well as our ideals, goals, and aspirations. Mr. Pramod Kumar Mishra, Physical Education Section, won 4 Gold and medals in "22th U.P. Master's Athletic Championship 2009-10" held on 9-10th January 2010 in Allahabad. Now he is selected for "31st All India Master's Athletic Championship", Chennai (from 04-07 February 2010) to represent U.P. Athletics Team. Mr. Shiv Shankar Tiwari (DRPG) also won 2 Gold and 1 Bronze medals in "22th U.P. Master's Athletic Championship 2009-10" held on 9-10th January 2010 in Allahabad. On the occassion of Teachers' Day, the institute honoured five faculty members who have completed 25 years. The five teachers include Prof. Sudhir Jain of the Civil Engineering Department, Prof. Brahma Deo of the Material and Metallurgical Department, Prof. Vijay Kumar Jain and Prof. Prakash Mahadev Dikshit of the Department of Mechanical Engineering and the Maths Department's Prof. P. Shunmugraj. Prof. P. K. Kelkar, the founding Director of IIT Kanpur, championed the cause of international collaboration in IIT Kanpur since its inception. The Institute benefitted from the Kanpur Indo-American Program (KIAP) in the days of its infancy and in recent times, the international cooperation is on the rise given our high level competency in academics and research, achieved in last 50 years. This one-day perspective workshop intends to honor Prof. Kelkar in his centenary year and seeks to provide a platform to our faculty and foreign dignitaries from the embassies of various countries for a dialog, in order to strengthen ongoing research partnerships and future interactions. This meeting will provide a direct window to the visitors about our expertise in niche areas of cutting edge research and high quality academic programs. The workshop will comprise of two oral sessions dedicated to research and academics and a poster session displaying research topics of ongoing international projects. The Convener is Dr. Sandeep Verma, Department of Chemistry. The Indian Institute of Technology, Kanpur (IITK) has received the Indian Space Research Organisation (ISRO) nod to launch its first and country's lightest nano satellite, Jugnu, by this December. The nod came after a second design review was presented by the IIT-K authorities. The satellite will be launched in the polar orbit from Sriharikota. IIT-K director Sanjay Govind Dhande said, "Though the memorandum of understanding between ISRO and IIT-K for the project was signed in February, regular review sessions are being carried out by ISRO to check the progress of the project." The first review session of the Jugnu was carried out by ISRO in April. "On Tuesday, our technical team working on the project apprised ISRO authorities of the release and antenna mechanism," said Dhande. A team of 12 professors and 40 IIT-K students led by professor and mechanical engineering department head, Nalinaksh S Vyas, have been working on the project since last December. A technical team of ISRO led by D Madhav Murthy, director (small satellite), said they had informed Isro authorities about the details related to the release of Jugnu by mother satellite in polar orbit, and also provided the details regarding the satellite antenna set up in the institute premises. "A similar project in any European country would have cost over Rs 10 crore but we expect the entire project to complete within a budget of Rs 2-3 crore, without compromising on quality. This is a welcome signal for indigenous remote sensing technologies," said Vyas. Weighing 3.5 kg, Jugnu would be 34 cm long and 10 cm wide. 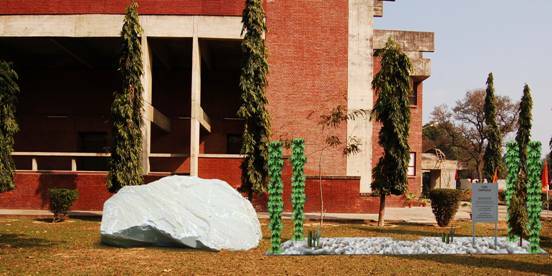 It would be equipped with micro imaging and micro electronic system, and transit images to base station at the IITK campus. "Although the stipulated life time of the satellite is six months, we are optimistic that it will complete at least 12 months in the orbit," said Dhande. The high-resolution pictures and data obtained will be used for various applications such as drought monitoring, wasteland management, urban planning and flood-risk management. IIT Kanpur was pleased to announced the Birth Centenary Year of its Founder Director, Professor P K Kelkar. 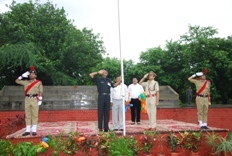 The Inaugural Function was held at 10 am on June 1, 2009 to coincide with the 100th birthday of Professor P K Kelkar. The venue for the function was the auditorium of the Outreach 69&80 building. Professor M Anadakrishnan, Chairman, Board of Governors, had kindly consented to presided over the function. Felicitation ceremony of Mr. Pramod Kumar Mishra for his distinguished achievements in the 15th Asian Masters Athletics Championship 2008-09, held at Chiangmai, Thailand on February 11, 2009. In the 15th Asian Masters Athletics Championship 2008-09, held at Chiangmai, Thailand during the January 13-17, 2009, more than 3000 athletics from 18 countries participated. A great contribution in this Masters Championship from Indian counterpart is a MILESTONE not only for IIT Kanpur and IIT Rajasthan but also for the entire IIT system. With such a great spirit of sport, our Indian contingent consisting of around 150 (men & women) athletes were among the participants. Mr. Pramod Kumar was the only participant from Uttar Pradesh who took part in the championship. Mr. Pramod Kumar was selected on the basis of his performance in the National Masters Championship held at Guwahati during March-08, where he won 2 Gold Medals. After confirmation from Masters Athletics Federation of India that he was selected for this Mega event for High-Jump, 110 M Hurdles, 400 M Hurdles and 4X100 relay held in Thailand. But due to injury, he could participate only in High-Jump and 4X100 M Relay, in which he won 2 Bronze Medals for the country. His hard work resulted with not only 2 medals but also a real inspiration for other sports persons in the country as well as in the Institute. With a great help from the Institutes viz., IIT Rajasthan and IIT Kanpur, he could win this MILESTONE. He also cherishes this motivation for upcoming events in the world athletics championship which will be held in Finland, July-August, 2009. He is also selected for the several other International Asian Athletics Championships in the year 2009, such as in Srilanka, Malaysia. Mr. Mishra is also responsible for the exemplary performance of the IIT Rajasthan Students in the Inter IIT Sports meet 2008 held at IIT Madras in December 2008. Priya Ranjani Dass, student of IIT Rajasthan won bronze medal under the praiseworthy guidance of Mr. Mishra. As recognition of the exemplary services, devotion to duty and extraordinary performance by Mr. Pramod Kumar Mishra, Indian Institute of Technology Kanpur and Indian Institute of Technology Rajasthan felicitated Mr. Pramod Kumar Mishra for distinguished achievements in the field of atheletics on February 11, 2009, Indian Institute of Technology Kanpur. Proessor M. Anandakrishnan, Chairman Board of Governers, IIT Kanpur, presided over the function and felicitated the awardees on November 28, 2008 at Auditorium, Outreach 69-80 Building, IIT Kanpur. Felicitation Ceremony opening remarked by Dean Resource Planning and Generation, Professor Sanjeev K. Aggarwal for instituting C. V. Shedhadri Chair. The Institute felicitated Professor Ashutosh Sharma, Department of Chemical Engineering, for TWAS award, Professor J. N. Moorthy, Department of Chemistry, for Bhatnagar Award and Dr. Yogesh Joshi, Department of Chemical Engineering, for Indian National Academy of Science, Allahabad, Young Scientist Platinum Jubilee Award in Physical Sciences (2008) by Professor Sanjay G. Dhande, Director of IIT Kanpur. An Ion Beam Complex for Science Engineering and Technology (IBC-SET), equipped with different types of low energy ion beam facilities ranging from few keV to few MeV, is being set-up at IIT Kanpur for carrying out research in the interdisciplinary areas leading to technology development and prototype device fabrication. Under this complex a state of art focused ion beam system was installed in 2006. Recently on 27th Sept 2008 a 1.7MV Tandetron accelerator equipped with micro beam facility was inaugurated. Prof. V. S. Ramamurthy, Prof. G. K. Mehta, Prof. R. M. Singru, Dr. S. Kailas and other eminent scientists, faculty members of our institute and other institutions graced the occasion. Prof. S. G. Dhande presided over the functmion. ii. Ion Beam synthesis of nano phases/ surface engg. iii. Surface/interface studies by RBS/ERDA/PIXE/Channelling. iv. Defect and damage studies in materials. v. Bio Materials; damage studies and 3D mapping. vi. Process optimization and system automation. 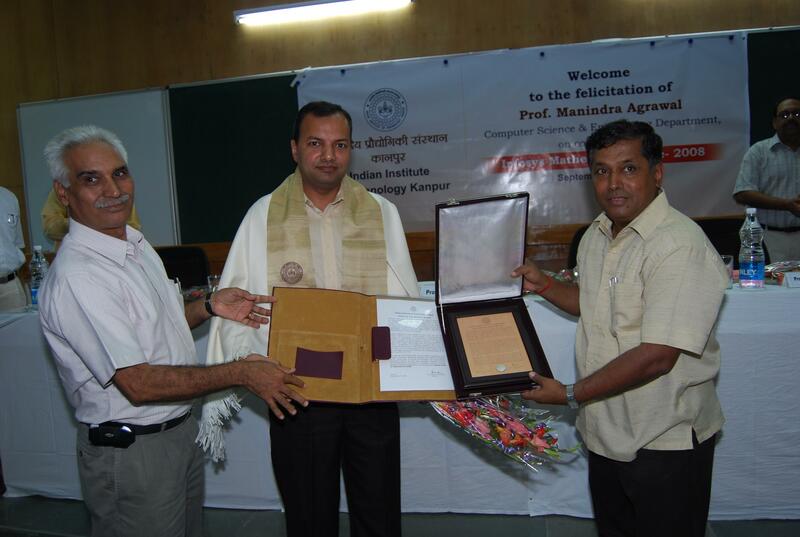 Felicitation ceremony of Prof. Manindra Agrawal, Computer Science & Engineering Department, on conferment of Infosys Mathematics Prize - 2008 instituted by Infosys, Bangalore was held on September 27, 2008. 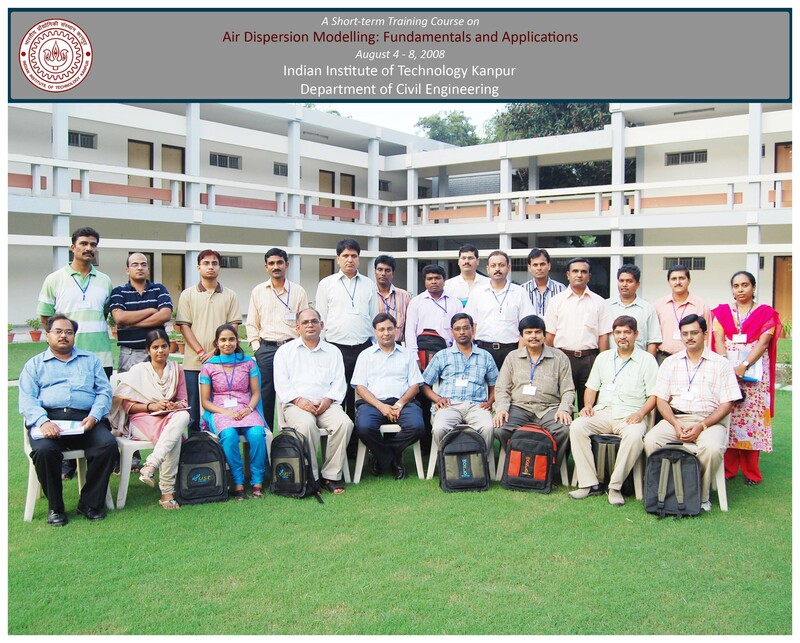 Indian Institute of Technology Kanpur is committed to excellence in teaching and in research. The quality of its graduates has been acknowledged throughout the world. Some of its Alumni have become leaders in their respective fields. Persons like Mr. Narayana Murthy have become icons of successful alumni of IIT Kanpur.